Whilst this album has many fine moments, it won’t appeal to everyone. 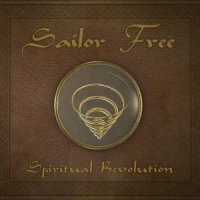 Not a band with whom I’m familiar, Sailor Free (what a terrible name) has been off the scene for 17 years having called it quits a couple of years after the release of their second album ‘The Fifth Door’. The Italian four-piece reformed in 2012 and they set about creating this concept album which is loosely based on J.R.R. Tolkien’s book ‘The Silmarillion’. I wish I could tell you more but frankly the promo blurb is unintelligible nonsense, consequently I haven’t a clue what it’s all about. David Petrosino appears to be the band’s driving force as, aside from being the album’s producer, he’s also the main songwriter, vocalist and keyboard player. His cohorts in this venture are Stefano Barelli (guitars), Alphonso Nini (bass) and Stefano Tony (drums) with a few guests supplying specialist instrumentation or voiceovers. The promo material states Sailor Free fall into the genres of Art Rock, Progressive, Alternative, and Psychedelic Hard Rock; I’ll add to that with Progressive Metal and Hard Rock, which therefore makes this a rather eclectic album. For me, they are at their best when they’re at their most restrained and refined as some of the psychedelic moments are a bit random and radical for my taste. The more I listened to this album I was increasingly struck by a similarity in approach to The Doors with Petrosino adopting phrasing akin to that of Jim Morrison. At other times he uses adopts a kind of New Romantic vocal style notably on ‘The Run’ which also has an angular riff, a highly melodic phase then a doomy ending. Encouragingly Petrosino shows very little in the way of an accent. The album features several instrumental tracks which are diverse and demonstrate the different facets of the band. ‘Spiritual Ouverture’ has a fine guitar refrain before it hits a Prog Metal phase which then transforms into a delightful laid back finale of piano and flute (courtesy of Stefano Ribeca). ‘Betray’ has a face melting riff while ‘The Entropia’ mixes Deep Purple with Dream Theater. Elsewhere ‘Daeron’ is a pièce de résistance with its splendid piano refrain that builds in pace and power while ‘Beyond The Borders’ has a modern feel in the guitar work yet a retro vocal that reminds me of Level 42 in places. The Doors and 60s comparisons arise at regular intervals notably on ‘A New World’ and ‘The Curse’ with the former having psychedelic properties and the latter showing Prog Metal leanings. The title track sounds a bit distorted which I suspect is deliberate as it accentuates the overdriven Hammond Organ motif that lends a touch of Deep Purple to proceedings. To prove the eclectic point this track suddenly takes on the style of Santana. I’d recommend this as one of those albums that needs to be sampled before buying because, whilst it has many fine moments, it won’t appeal to everyone.